If you’re throwing a bbq or pot luck for the upcoming holiday weekend, use these easy 4th of July decorating ideas to make your gathering extra special with patriotic touches made from paper. A festive banner done in red, eco-white and blue (I mean, lake!) will add instant charm to your celebration. 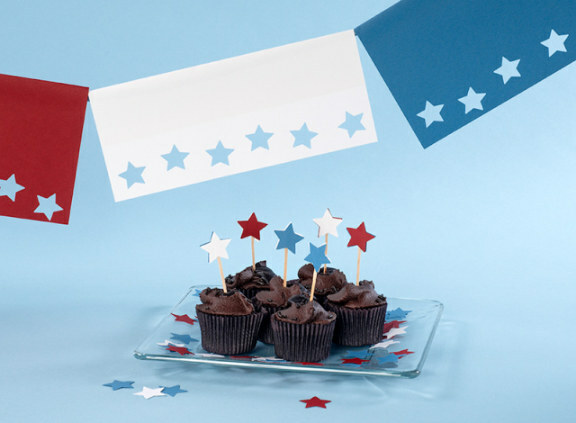 Adhere the leftover star punch-outs to toothpicks to dress up your 4th of July cupcakes, cheese plate or hors d’oeuvres. Or use them loose as table confetti. Couldn’t be easier! And as always, you can use these decorating ideas for any occasion by swapping out your paper colors and punch shape. P.S. Check out our Independence Day paper rosettes from last year – so lovely, we want to use them again! 1. To make the 4th of July banner, begin by cutting red, eco-white and lake papers in half widthwise to 8 1/2″ x 5 1/2″ (see A in How to PDF) using scissors or blade trimmer. 2. Punch stars along one 8 1/2″ edge (B) of each sheet. 3. Fold over opposite edge, as indicated by dashed line, in varying, random widths (C). Repeat to create desired length of banner. 4. Apply super tacky tape along the inside folds (C). 5. Place ribbon into folds and remove tape backers to secure in place (D). To make the cupcake toppers, adhere two star punch outs back to back on either side of a toothpick. alexis – so true! punch. fold. string. enjoy!